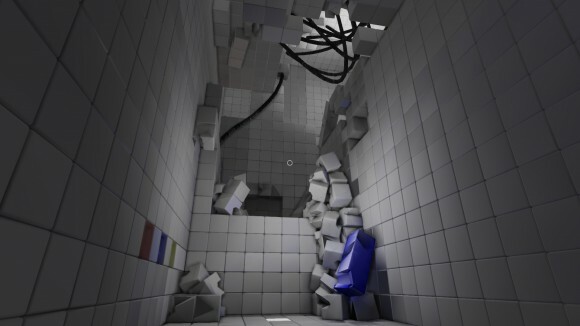 QUBE’s a post-Portal first-person 3D puzzler. What were we going to call them as per the AR podcast? Portatoes? I can’t recall, which is rarely the best way to birth a nomenclature. Anyway. From the outset it’s reminiscent of the first Portal game, to the point where it all seems dreadfully suspicious. Waking up in a neat white facility with no idea what you’re doing there or why? Exploring a clinical setting broken down into separate rooms with environmental puzzles to solve? The discovery of some weird ability specific to the place you find yourself in? The use of specific types of interactive element in each room to navigate yourself or an object to a destination? The later bits I won’t mention because spoilers? It’s of limited worth to dwell on the similarities, however. 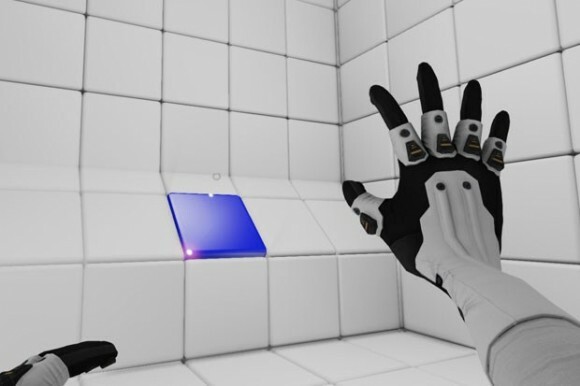 Yes, QUBE is startlingly similar to Portal, and yes, you could argue that’s pretty shameless. On the other hand, what better a framing mechanism for a puzzle game? If you’re going to wrap a narrative around it at all, why not something like this? You could turn it into a psychological thriller/sci fi horror ala. 1997’s Cube, I suppose, but you’d probably be missing the point. The point is the puzzles! So how are those puzzles? Well… they’re pretty intuitive, on the whole. Perhaps too much so. It’s probable that you’ll breeze through the first half of the game with little trouble in just over an hour. Admittedly I’d previously spent twenty minutes with the game at Rezzed learning the ropes, but that only gave me the headstart of already knowing the game’s simplest puzzles. Puzzles essentially work via a variety of different block types and the player’s ability to interact with them using a push or pull gesture (uh, with their magic physics gloves). Red blocks can be slid up to three blocks out from their starting point. Yellow blocks come in threes and depending on which of the three you pull will protrude in different ways. Blue blocks are springs and are pushed in to set them. Green blocks can’t be interacted with, and must be moved around using other block types. Purple blocks revolve parts of the room. Clear and white blocks reflect light beams in different ways, typically to power a generator or switch. That’s the gist: a bunch of different blocks and two ways of interacting with them. The game’s strength lies in how quickly this becomes entirely intuitive – with little of the irksome split-second reactions or pixel-perfect positioning Portal sometimes demanded. There are certain puzzle types that do demand timing, notably the ball puzzles which involve sequentially unlocking parts of a ramp and using the different block types to get a coloured ball to a specific destination. One of the game’s most entertaining puzzles involves doing this whilst also allocating balls different colours on their way down the ramp, including mixing primary colours to produce a secondary colour. Fun! For the most part, though, solutions are fairly obvious, and even when they’re not a little experimentation will soon open your eyes to the solution. Towards the very end of the game the difficulty ramps up considerably – the Steam version offers achievements reflecting this, particularly those for “the game’s toughest puzzle” parts one and two. At this point the elegance of the game fractures a little, firstly by demanding constant experimentation and resets rather than intuition and secondly by requiring fiddly, precise positioning that the game’s mechanics aren’t set up to elegantly facilitate. I found the edges of blocks occasionally got caught where they shouldn’t have, and stopping or starting movement was pretty fiddly as well – misjudging the latter often meant manually resetting several recent moves too, which is never fun. There’s a real sense of accomplishment to be derived from beating the bastards, but nonetheless this issue suggests an explanation for the larger problem with the game. It’s very short indeed – about three and a half hours end to end for my playthrough – and most of that sees you coasting through puzzles. So either the game’s mechanics don’t lend themselves to really brain-bending puzzles – of a less awkward type than those I previously mentioned – or the game’s developers ran out of practical ideas for their implementation. It’s a shame because to use an old cliché the game’s conclusion left me wanting more. Part of that is because the means of interacting with puzzles is a lot of fun, but the other part is because the game’s narrative is wholly suggested, with not a single word of dialogue throughout. It’s told instead through experience and environmental manipulation, which I like, though apparently there was originally narration which was pulled at the last minute – so this could be accident rather than design. Despite its short length and relative simplicity, QUBE’s a pleasant, entertaining and even at times atmospheric experience. It’s worth a look – but consider how much of your money each hour of entertainment is actually worth. TL;DR: "This game is kind of neat. I liked it." I saw this at Rezzed and was immediately put off by the way it looked. I also seemed to have developed a dislike for 3-D spatial puzzlers. All the same it looks like this turned out okay and it sounds like people who like Portal will like this. I am curious about the spoken stuff being removed from the game. They should release a director's cut with that stuff in there. Since it's up on Steam I imagine we'll see a free update later in the year including the audio and such. I hope they make it an optional thing you can turn on and it remains off by default. I liked the sense of isolation. The visuals are very clean and sparse (like Portal) but that's to facilitate clarity of understand with the puzzles (like Portal). 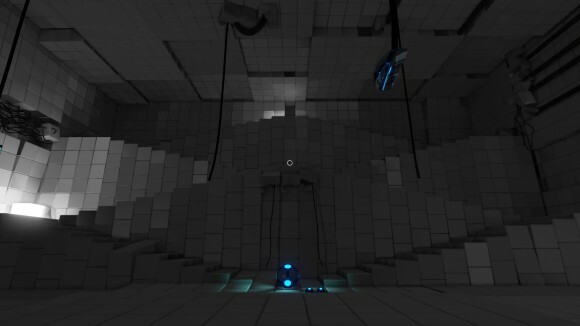 Q.U.B.E is available for a mere £3 on Steam for the next five days. If you were toying with giving it a go, now's the time!